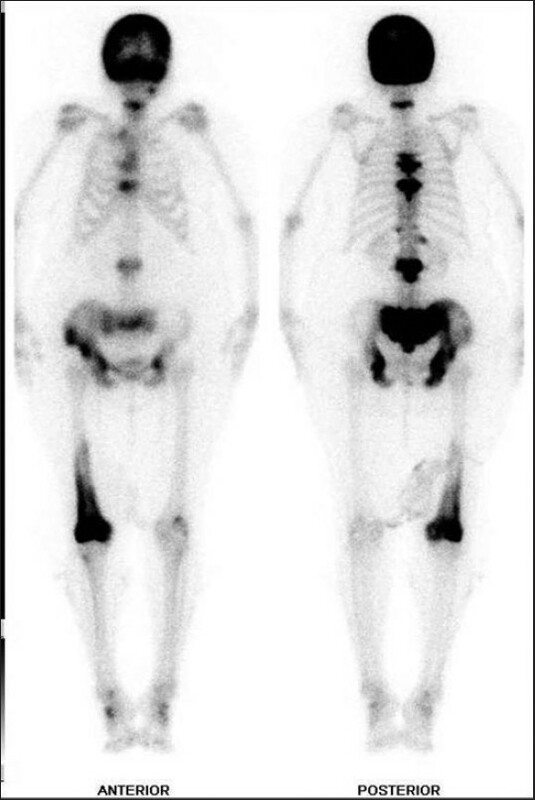 The author describes the utility of serial bone scintigraphy to rule out metastatic bone disease in a patient with carcinoma of breast with Paget's disease mimicking multiple skeletal metastases. The author describes the utility of serial bone scintigraphy to rule out metastatic bone disease in a patient with carcinoma of breast with Paget's disease mimicking multiple skeletal metastases. A 59-year-old postmenopausal female was referred for a bone scintigraphy in February 2008, with a history of back pain, she was diagnosed as a case of carcinoma of breast in 2007 and underwent mastectomy followed by chemotherapy and radiotherapy in 2007. 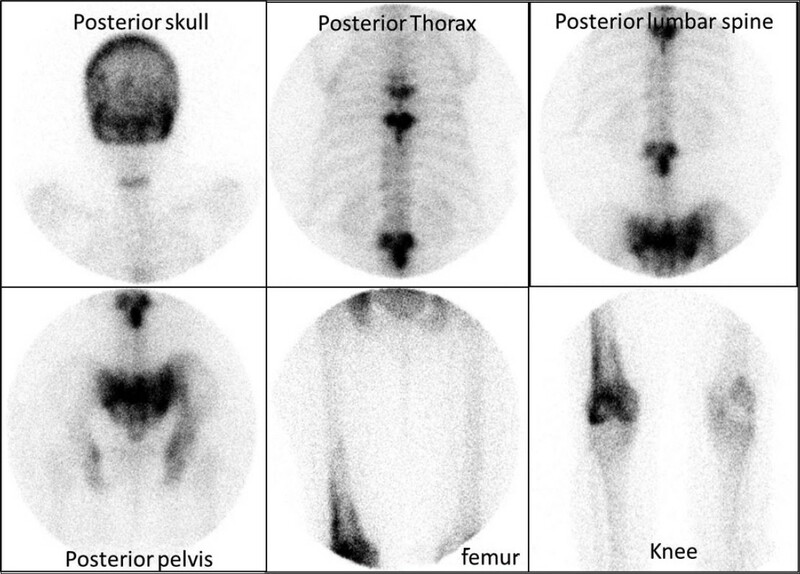 Whole-body bone scintigraphy was performed three hours after intravenous administration of technetium-99m methylene diphosphonate (MDP) and the images revealed multiple skeletal lesions involving skull, multiple vertebrae, sacrum, pelvis on both sides, and lower half of the right femur with characteristic features of Paget's disease like homogeneous pronounced uptake in the skull, "Mickey Mouse" pattern in multiple vertebrae in spine, increased radiotracer uptake typically abutting one joint and extending into the diaphysis, and so on [Figure 1]. The scintigraphic features were suggestive of polyostotic Paget's disease. The patient was requested for bone biopsy for confirmation of diagnosis, but she refused. In view of this, the patient was advised for a follow-up bone scan. She was lost to follow-up and subsequently after two years, a repeat bone scan was done in August 2010, which revealed similar findings with no new lesion [Figure 2]. No treatment was done during this period. In view of similar bone scan features even after two years, bone scan features were highly suggestive of polyostotic Paget's disease. Thus, a serial bone scan is helpful to rule out skeletal metastases in patients with known cancer and with associated Paget's disease. In conclusion, the present case report emphasizes the importance of serial bone scan and also to bear in mind the association of Paget's disease in a patient with carcinoma of breast which mimics multiple skeletal metastases. 1. Sundaraiya S, Pradhan PK, Gupta A, Jain M, Mishra SK, Das BK. Coexistence of carcinoma breast and Paget's disease of bone. J Cancer Res Ther 2008;4:48-9. 2. Estrada WN, Kim CK. Paget's disease in a patient with breast cancer. J Nucl Med 1993;34:1214-6. 3. Pulkkanen K, Partanen K, Kataja V. Pagetic bone lesions in a patient with early breast cancer: A pitfall for diagnostic misinterpretation. Acta Oncol 2002;41:566-8. 4. Merkow RL, Lane JM. Paget's disease of bone. Orthopedic Clin North Am 1990;21:171-89. 5. Patel U, Gallacher SJ, Boyle IT, Mc Killop JH. Serial bone scans in Paget's disease: Development of new lesions, natural variation in lesion intensity and nature of changes seen after treatment. Nucl Med Commun 1990;11:747-60. 6. Fig LM, Gross MD. Metastatic prostate carcinoma mimicking Paget's disease on bone imaging. Clin Nucl Med 1989;14:777-9.